What does a blogger do when an amazing friend surprises you with a box full of British chocolates? You collect up a kid and do a taste testing for "review" purposes! In this case, Ben was more than willing to help me delve deep into the box and choose two candies to try out. I know that it's a real struggle and trial for him, but he seems to be pretty good natured about it. 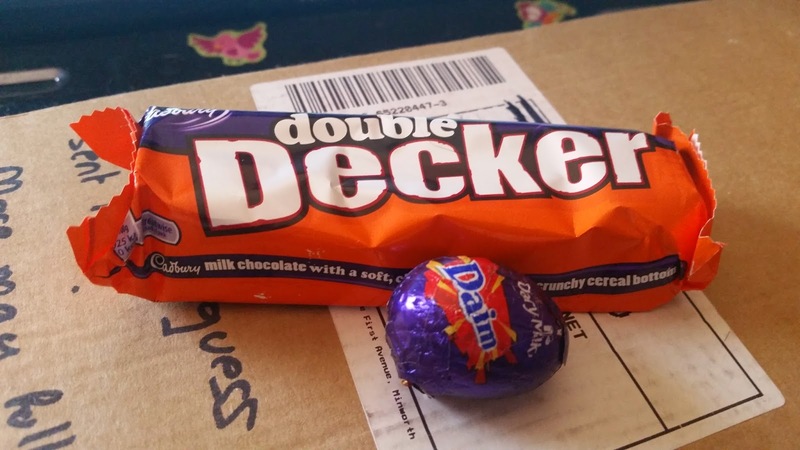 Today's choices are the Cadbury's Double Decker bar and the Cadbury's Daim Eggs. Since he's being so good natured about this, I let him choose and I'll reveal his opinions first. Ben - This doesn't taste like Hersheys but it's good. I could taste a lot of caramel and the nuts. The chocolate was sweeter than what we usually eat. It might be too sweet for me. Mom - I agree with Ben. It is certainly more sweet and I was immediately hit with the caramel flavor. However, I never got the almond pieces. Perhaps I was expecting something a bit chunkier when it came to the nuts, though. Overall, it's honestly a piece of candy that I could have one of, enjoy and be good for the rest of the day. It might be great for those trying to cut back on candy consumption! Ben - I enjoyed this one better than the other one. I liked the crunchiness of the cookie portion. It wasn't as sweet, either. I could eat this for breakfast every day, even if it's not healthy. Mom - I agree with Ben, again! (Wow, agreeing with a teenager twice in a row has to be a new record of some sort!) This one certainly wasn't anywhere near as sweet as the Daim. Thank goodness! When I tried the nougatine (that so sounds like nicotine in my head), I got a very strong flavor of coffee and even after eating it together, I was left with a coffee aftertaste in my mouth. Oddly enough, while the individual components had good flavor, when combined, it mellowed out into something that wouldn't stick out in my mind. All in all, British chocolate is in a class all its own and we're looking forward to trying out all of the other flavors in this box!